I have a couple of links that I thought were so good, I had to share them with you. 1. First off is a series that Ellen Oh is featuring on her blog called ‘What Diversity Means to Me’. She will feature authors who write about diverse main characters. This series will go until April 24th and end with an interview on the Enchanted Inkpot with Stacy Whitman, Editorial Director of Tu Books and one of her new authors, Kimberly Pauley. 2. Lynne Kelly has created a beautiful book trailer for CHAINED and talks about how she created this trailer here. 3. What’s selling in YA? Kate Hart has put together an amazing set of graphs in this post! 4. Beth Revis and the Elevensies share their Top Three Things You’ve Learned about their debut year as a writer. 5. Truly Bookish and One Page At a Time are doing a fantastic challenge inspiring readers to read more multi-cultural books with their 2012 Muti-Cultural Book Challenge. The goal of this challenge is to read 12 minority YA books for the year. The books can be newly published or been around for a long time. Every month, they will feature a book or author that meets the criteria and do a book giveaway. 6. For a Goodreads multicultural List, go here. Thanks, Christy. These are great links! That break down of what’s selling in YA was surprising. I don’t think most people expected contemp to take up such a huge piece of the pie. But when I think about it, the majority of my YA books are contemp. I’m so glad you all found these helpful! Always fun when someone else does all the research 😉 thanks for the links. Great links! Thanks so much. 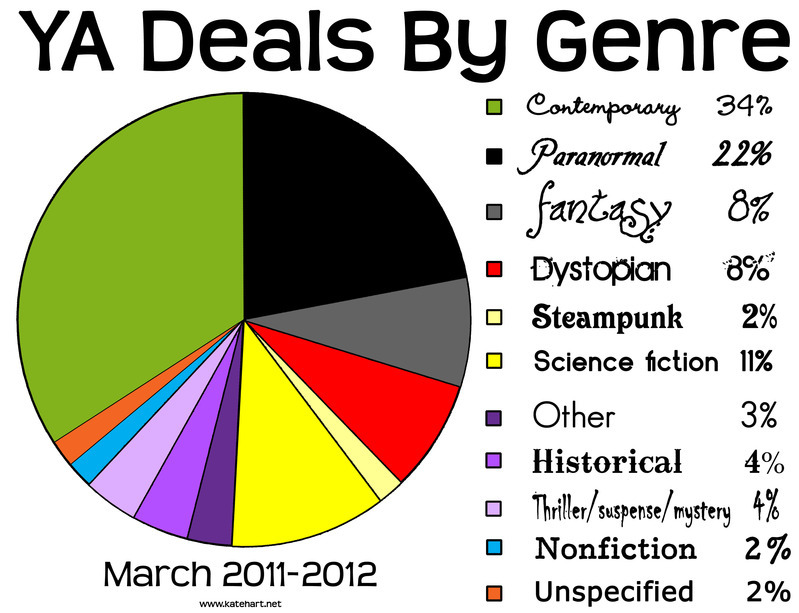 I’m surprised by the graph too–thought for sure paranormal would be higher. I’m mostly a MG reader though, so I’m going by what I hear, not read. Love that pie chart. I think what I take from it is that contemporary is the mainstay, while the other categories are more likely to shift in size.